Panel Built representatives Dave Arnold, Stephen Maddaleni and Margie Schramke attended a Lean Consortium meeting in Gainesville on Wednesday, September 28th. This is the second Lean Consortium Panel Built has attended. The mission of the Northeast Georgia Lean Consortium is to help businesses become “leaner” and more efficient. It is comprised of a group of businesses who are committed to sharing ideas about Lean Manufacturing and continual process improvement. The host company for Wednesday’s meeting was Packaging Specialties of Georgia, a large printing plant that employs 90 people and produces printed stretch film for a variety of packaging applications. The Panel Built group joined other consortium members for a tour of the plant. During the tour, it became obvious that Packaging Specialties is a company that takes their “Lean Journey” very seriously. There were numerous visual displays, along with some truly innovative solutions to everyday challenges. For example, restocking commonly used parts is facilitated by visual Kanban cards that describe the part, along with the re-order number and include a photo of the item itself. These are placed at the pull point, right after the “need to re-order” quantity is reached. Their solution to the common problem of time consuming and unproductive morning meetings is a “War Room” which charts daily schedules and other “need to knows” on the walls of a room with no table and no chairs. This leads to short, productive meetings that release people quickly to go do their jobs. Stephen will apply some of the methods he observed for basic housekeeping measures, a simple example is taped areas on the floor that indicate placement of everyday items like trash bins and carts. He is also interested in implementing Kanbans for improving material flow and restocking with “first in, first out” systems for rotating inventory with visual cues to reorder when a minimum stock level is reached. 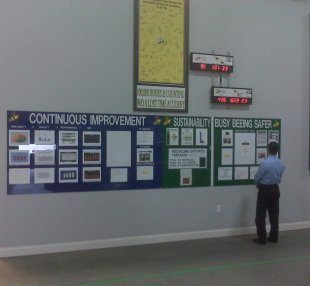 As a company, Panel Built is committed to Lean Manufacturing methods in order to improve efficiency, reduce waste, and pass the savings on to our customers. We look forward to the next Lean Consortium event, and the learning opportunities it will provide. In the near future, we will host an event, and share our own innovative ideas and processes with other members.